In 1904, a physician wrote about a patient with leukemia who went into remission when he got the flu. Though the patient was not cured, it was a ray of hope at a time when there were no treatments for leukemia. Other cases were reported throughout the years of people with Burkitt’s Lymphoma and Hodgkin’s Lymphoma going into remission when they had the measles. Since then, these observations stimulated experimental efforts to find a way of using viruses to cure cancer. In the early days, with limited strategies to treat cancers, these experiments included harvesting infected tissues from sick individuals and giving these infections to patients with cancer. Cancer patients were infected with mumps, hepatitis, west nile virus among others, each experiment resulting in some patients having remissions or reductions in the size of their tumors. Unfortunately the remissions were short-lived and many of these experiments were less than scientific and ethically questionable. Since 1974, studies have become more scientific and are guided by Institutional Review Boards or IRBs protect the welfare of research participants. Genetically engineering and modifying virus genomes moved forward in the 1990’s and mid 2000’s. One such modification that scientists use to create oncolytic virus treatments involves removing the gene in the virus that is necessary for the virus to cause disease in normal, healthy cells. Another modification is to remove the gene that the virus uses to hide from the immune system. These two modifications ensures that an oncolytic virus kills only cancer cells and that these viruses attract an immune response. Cancer cells also use special tricks to hide from the immune system but as the oncolytic virus kills cancer cells, it makes those cancer cells visible to the immune system. Then the immune system can identify cancer cells as other and attack uninfected cancer cells. In this video, a head and neck tumor patient in Great Britain experiences remission using this treatment. The first oncolytic virus treatment approved by the FDA [talimogene laherparepvec (Imlygic)]is a herpes virus that has been genetically changed to stimulate the production of immune cells in the body. It has been approved to treat melanoma. For patients with glioblastomas, the average survival after treatment with surgery, chemotherapy and radiation is only 15 months. Yet in a recent phase I study of 25 patients with the brain tumor glioma that had recurred, a modified cold virus was given in a single treatment to the site of the recurrence. Twenty percent of the patients survived over three years from that single treatment. There is much work going on in this area of immunotherapy, especially as research indicates that oncolytic viruses are working better in conjunction with checkpoint inhibitors. A small phase I study using this combination therapy had an overall response rate of 62% and a complete response rate of 33%. 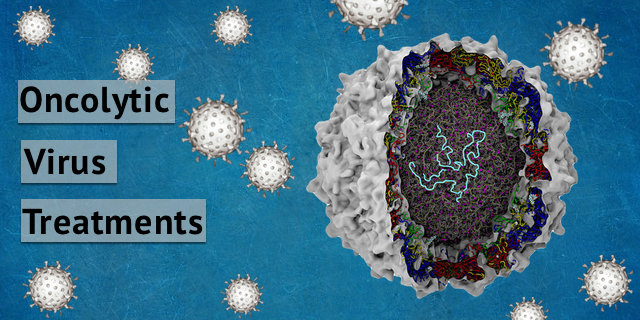 Below is a video with a visual explanation of how oncolytic virus treatments works.